Stairs and railings are hardworking fixtures in many homes. While they fulfill simple functional purposes, they can also be a grand and welcoming centerpiece when guests walk through your front door. But when it comes to giving your stairs and railings a well-deserved facelift, you may be wondering if you should paint or stain them — or do both. Making the right choice can transform the look of your stairs and even the interior of your house. The wrong choice can leave you with an eyesore or with a staircase in stark contrast to the overall design or aesthetic of your home. The following tips for painting and staining stairs and railings will help you make the best decision. Your time is valuable, so it’s important to first understand how long a stair painting or staining project will take to complete. Prep work can often take longer than the painting or staining itself. Stairs that are currently painted may just need a quick sand and repaint. But stairs that are carpeted or have layers of paint and varnish will require more prep time. By far the most popular choice today, many homeowners are painting over their stained stairs and railings. More than just about any interior painting project, painting stairs requires proper prep work. The surfaces are often taped and tarped and then sanded to remove the shiny clear coat. A special primer is then applied, followed by two coats of glossy paint in any color. If your stairs are already painted and you’d like to stain instead, professional painters will need to expertly strip the existing paint from the stairs. From there, they will also sand your stairs before the stain can be applied evenly. 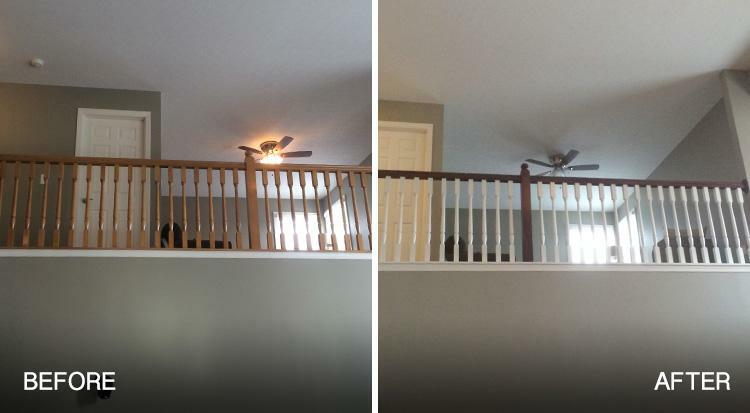 Because this process is more time-consuming and costly compared to painting over stained wood, most homeowners opt for painting their stairs instead. It’s important to note that choosing high-quality professional painters will ensure that you receive an exact quote and project timeline for your stair painting or staining project that fits your budget and schedule. Stairs can be both functional and beautiful, and for maximum design punch, they should match the overall design of your home. Older homes generally look better with stained stairs, while updated or modern homes can usually support paint in a variety of colors. If you have an older home with updated elements, consider painting the risers and staining the treads. For a newer home, try painting just the railings in a new accent color that pops. This will make your stairs stand out and draw attention to the spindles and handrails. Are the stairs you’re considering painting located in the main part of your house? Are you a shoes-on or shoes-off household? Properly stained and sealed stairs and railings will last for decades under heavy wear and tear, even more so if you include protective treads or a properly installed runner. Painted stairs and railings, especially when prepared meticulously and using the right paint, can also have a long life. Compared to stain, however, they do tend to have a shorter time staying scuff or damage-free. So, you may want to consider darker paint for treads, or protective runners to maintain the overall look. 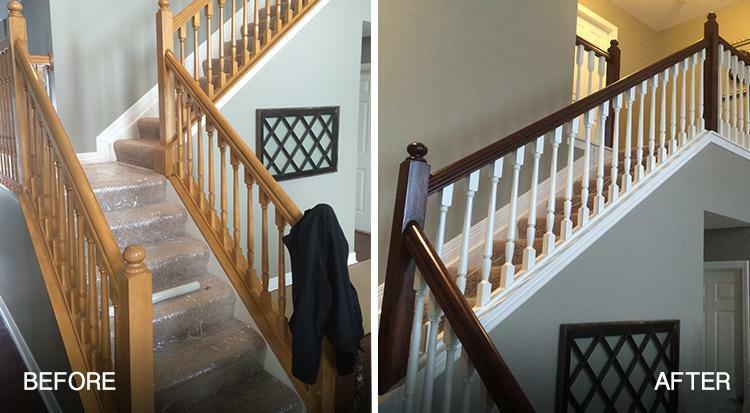 If you’re looking to paint or stain your stairs, professional interior painters can save you hours and hours of meticulous, manual labor and help you avoid costly mistakes. Plus, when you work with a high-quality, reputable painting company, you can receive a free estimate and expert help with design and paint color choices. Get a free stair painting quote today! 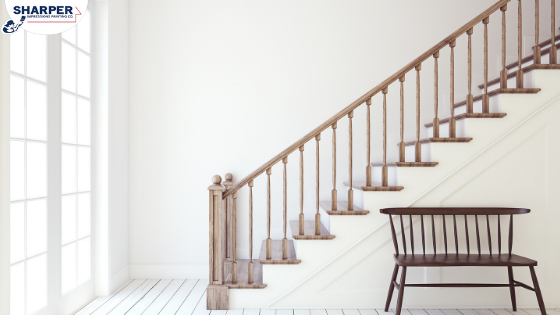 Home » Recent Projects » Should You Paint or Stain Stairs and Railings in Your Home?